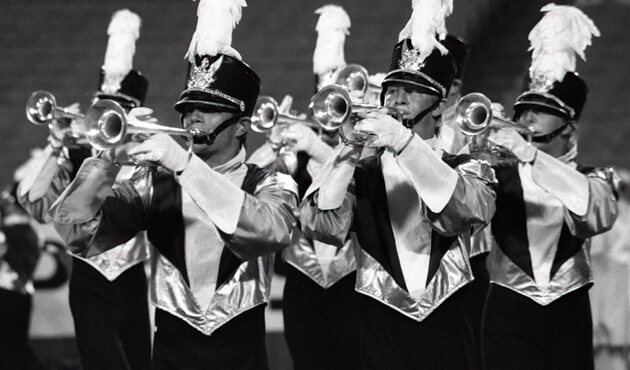 In 1988, the Drum Corps International World Championships came to Arrowhead Stadium outside Kansas City for the first of two consecutive years. Blue Devils—newly adorned in black and gray uniforms—had been undefeated until the final week of the season, slipping to 3rd place in the Finals competition. Madison Scouts, 4th at the Drum Corps Midwest Championships at the end of July, rallied to 1st for the corps' 50th anniversary, while Santa Clara Vanguard placed 2nd for the fourth year in a row. But the most talked about show of the season was likely Suncoast Sound's 10th place production that was contemporary to the extreme and perhaps just as controversial. 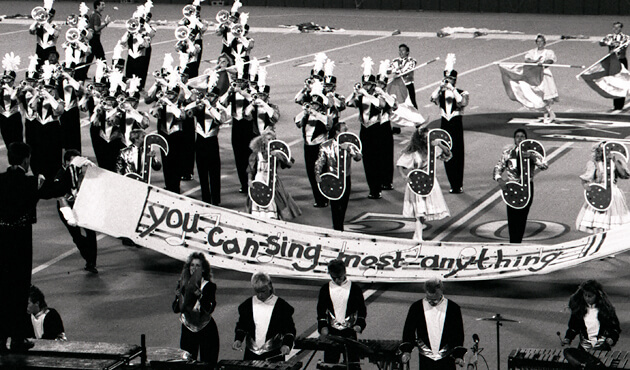 In 12th place, Sky Ryders performed a show based on the soundtrack from "The Sound of Music." Originally a smash hit Broadway musical in 1959, "The Sound of Music" was inspired by the 1956 West German documentary, "Die Trapp-Familie," which itself was based on matriarch Maria von Trapp's 1949 book, "The Story of the Trapp Family Singers." The musical was written by composer Richard Rodgers and lyricist Oscar Hammerstein II. Together, they won 34 Tony Awards, 15 Academy Awards and the Pulitzer Prize. Besides "The Sound of Music," their hits included "Oklahoma!," "Carousel," "South Pacific" and "The King and I." The 1965 movie starring Julie Andrews (just off her Oscar-winning performance the prior year for "Mary Poppins") and Christopher Plummer, won five Oscars at the 1966 Academy Awards including Best Picture and Best Director. Maria was orphaned by age seven and graduated from a teachers college prior to requesting permission to enter a Benedictine abbey. While teaching fifth grade, she was asked to instruct the seven children of a widowed German naval commander. The commander asked her to marry him, but she wasn't in love with him and fled back to the abbey. After returning, she fell in love with him, married and the couple had three more children of their own. The family started singing together semi-professionally after experiencing financial ruin due to the collapse of their bank. In 1935, the Austrian Chancellor heard them in concert and extended an invitation to sing at a festival, which led to a successful tour. The family fled Austria in 1938 as the country was annexed by Nazi Germany. Sky Ryders' show opened with the main theme of the musical. The color guard was paired off with males portraying Captain von Trapp and the females, twirling huge double flags, portraying Maria. Each couple and the corresponding flags was a different color of the rainbow, a familiar symbol of the corps. "Do-Re-Mi" was the most energetic and lighthearted segment of the show, replicating how Maria made up the song to teach the major musical scale to the children. One of the captivating and creatively brilliant elements of the song is how the names of each pitch were sung on the corresponding degree of the scale. Sky Ryders replicated this fanciful moment in the production seen in the accompanying video clip. The corps' jazzy arrangement of "My Favorite Things" was a swing version of the tune Maria sang in the musical, regarding what she thought about when afraid of the unknown and the future. This was followed by "The Lonely Goatherd," a song that had a double purpose in the musical: On the surface it was just about a yodeling goatherd (like a shepherd, but one who herds goats instead of sheep), but it also served to convey the emotion of Maria's falling in love with the Captain. After three high-intensity selections in a row, it was time for a breather. "Edelweiss" was the only song in the corps' repertoire that was introduced in Act II of the musical. Added to the musical after tryouts began in Boston, it was the last song Rodgers and Hammerstein wrote together. Hammerstein passed away nine months after the Broadway premiere. The show ended with "Climb Ev'ry Mountain," an inspirational piece about never giving up the desire to achieve one's dreams. Sky Ryders transitioned from "Edelweiss" into a rather short rendition of the piece, with all members of the color guard spinning large flags the color of their individual costumes. A brief recap hinting at the prior melodies in the show brought the production to a rousing conclusion. For this week only, you can save on the Legacy Collection DVD that contains this complete Sky Ryders performance, along with all finalists from the 1988 DCI World Championships. Discount DVD offer ends Monday, May 12.